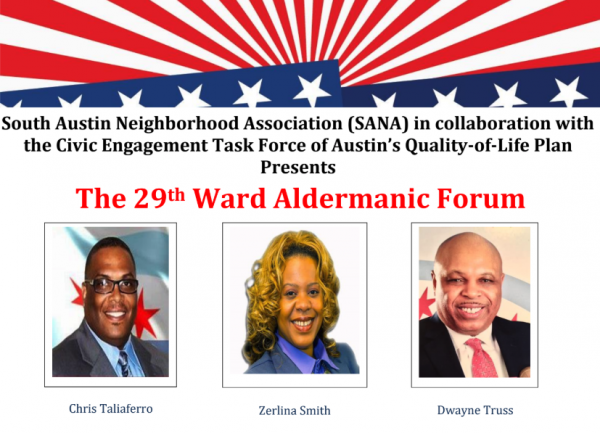 South Austin Neighborhood Association (SANA) in collaboration with the civic engagement task force for Austin’s Quality-of-Life Plan will host a forum featuring the three candidates running for 29th Ward alderman: Zerlina Smith, Chris Taliaferro and Dwayne Truss. The purpose of the forum is to inform residents of the 29th Ward about the candidates, important issues facing the ward, and the candidates’ views on those issues and plans to address them. Candidates will be questioned on those issues determined by a committee of community residents and organizations to be the most pressing for the 29th Ward. The forum is open to the public. “There has been a lot of attention given to the mayor’s race during this election, and certainly that is very appropriate, but we do not want the aldermanic race to get lost,” SANA President Casandra Norman said in a statement. “Aldermen have a tremendous impact on the development of their wards and the lives of their residents, and we deserve to be just as informed about the candidates for alderman as we are about the candidates for mayor,” Norman said. The candidates forum is co-sponsored by SANA, the Chicago Westside Branch NAACP and Austin Coming Together. Doors open at 5:30 p.m., and the forum will begin promptly at 6 p.m.